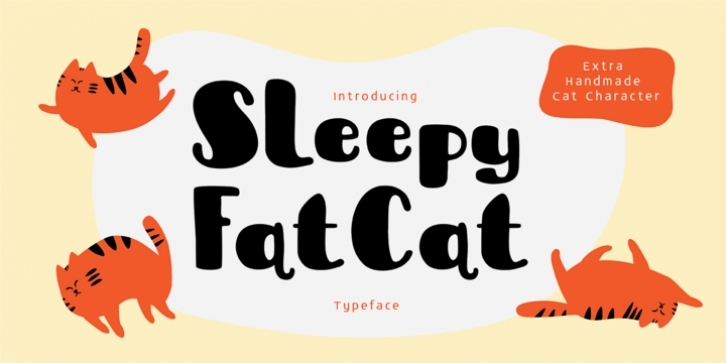 Introducing Sleepy Fat Cat typeface. A hand-made lettering, inspired by cute fat cat character. Do you know a fat cat? Perhaps you have a fat cat of your own that watches you while you design? Maybe you don't even like cats! Whatever the case, you'll love this font! An almost childish look with bonus kitty graphics! This doodle bold typeface can create some fun & playful character on your design. This typeface come with uppercase, lowercase, punctuation, numbers, alternate and an extra character. Extra comes with 8 hand-made cat characters. TTF and OTF files are included.